Post Only（只挂单）/ IOC（立即或取消）/ Release on Trade(交易后发放) / Sweep Collateral（流动抵押）. For more information on these terms, refer to ‘Tutorials: Order Types on eosfinex’. For tutorials, visit ‘Tutorials and Lessons’. eosfinex is the first high-performance, on-chain exchange built on EOSIO technology. As a trustless trading experience, eosfinex facilitates a highly-scalable network of peer-to-peer value exchange, unconstrained by borders and built around a foundation of transparency, speed and integrity. To start trading on eosfinex, visit paper.eosfinex.com. The eosfinex beta works as a simulated ‘paper trading’ environment using test tokens. To reiterate, the eosfinex beta uses test tokens only, and no real tokens can be traded. To receive test tokens, visit paper.eosfinex.com/faucet/, enter your EOS mainnet account name and press ‘Send’. Your test tokens will be sent to your EOS mainnet account and should be visible within 10 seconds. Refresh your eosfinex balance to view your new balance. To get started, press login. In the modal box, you can choose to sign in with either Scatter or your private/public key pair. Use the appropriate option to sign in. If you do not have an eosfinex account, you can choose to create one. 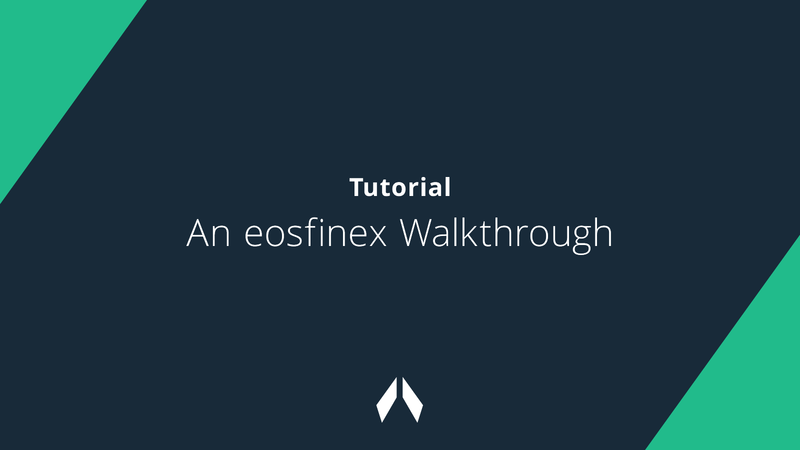 Creating an eosfinex account requires holding at least one EOX in your EOS account. EOX is used to allocate CPU, RAM and network resources for trading. With EOX we ensure fair resource allocation between all traders. EOX is available through the faucet (see above). You can create an account with Scatter or private/public key. If you wish to create an account with public/private key pair, select ‘Don’t have an account’. If you wish to create an account using Scatter, select ‘First time connection’ and fill out how much EOS to transfer from EOS mainnet to the sidechain account with your newly created user. Then follow the onscreen instructions from Scatter. If you wish to connect to the eosfinex beta using Scatter, please follow the instructions as outlined here: Logging In Using Scatter. Your balances are split between 3 wallets — Mainnet, Sidechain & Exchange. Mainnet: Your mainnet token balances. Sidechain: Your eosfinex sidechain balances. You can transfer balances between your 3 wallets at no added fee. Step 3: Transfers → What’s next? Your funds must be in the Exchange wallet in order for you to trade. To transfer your balances from the Mainnet wallet to the Sidechain wallet, and from Sidechain to Exchange, press the ‘Transfer’ button in the top-right corner of the eosfinex UI. When specified, press “Request Transfer”. Your balances should reflect the changes after roughly 3 minutes. Please note that you can only transfer between Mainnet and Sidechain and between Sidechain and Exchange (and vice versa). No fees apply when transferring balances between wallets. Once you sign up you automatically reserve a small amount of resources on the Sidechain. This is handled by the initial 1 EOX required to create your account. If you require more resources, you can also buy/sell RAM or stake for CPU or NET resources using the EOX resources component. Staked is the amount of EOX currently staked in CPU and Network resources. Unstaked is the amount of EOX available in your sidechain balance, that can be used to stake for resources. Buy or sell RAM resources on the EOS blockchain. For more information on network resources, please refer to this overview by EOS Asia. Post Only / IOC / Release on Trade / Sweep Collateral. Any questions? Visit the eosfinex Telegram for support.